On most days, the lot to the east of the 51st Street Green Line ‘L’ station doesn’t look particularly remarkable. There are a few brightly colored freight shipping containers sitting in an empty field, seemingly discarded. But Wednesday afternoons, from 4-7 p.m., the lot comes to life. The shipping containers become stores and a bike repair shop. Local and regional businesses set up tables to sell food, clothing, jewelry and sweets. A disc jockey sets up near the middle, playing music. Before long, the field turns into a plaza filled with regular customers and curios passersby. 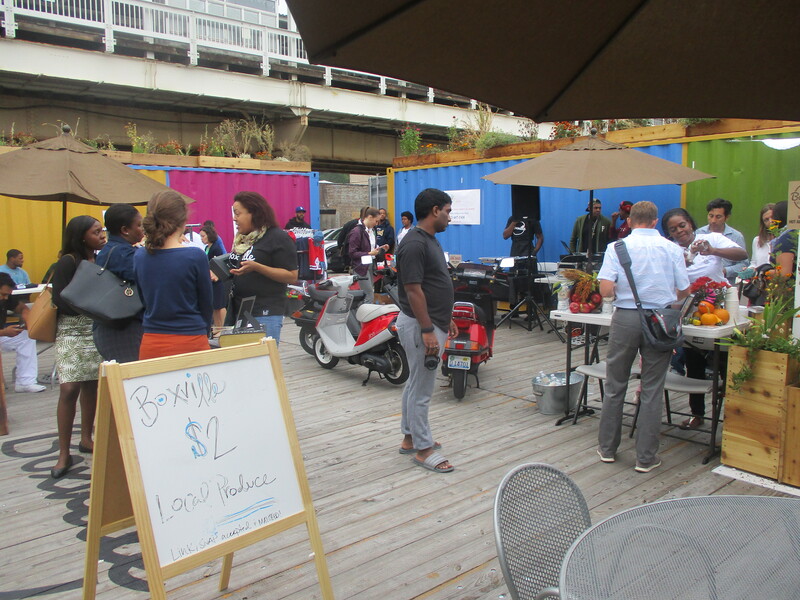 Since June 2017, the Boxville Marketplace has become fixture in South Side’s Bronzeville neighborhood. Local developer Bernard Loyd created it in hopes of creating a space for local entrepreneurs that would be easier to set up and rent out than a traditional brick-and-mortar space. While Boxville is closed for the season, the organizers plan to reopen it sometime in April and keep it open until October. Bronzeville is one of the oldest black neighborhoods in Chicago, and it was traditionally the commercial and cultural center of the city’s African-American community. But during the second half of the 20th century, the changes in the South Side population patterns, loss of stock yard and steel mills, discriminatory lending practices and attempts at urban renewal saw the community’s fortunes turn for the worse, and its commercial corridors fell on hard times. 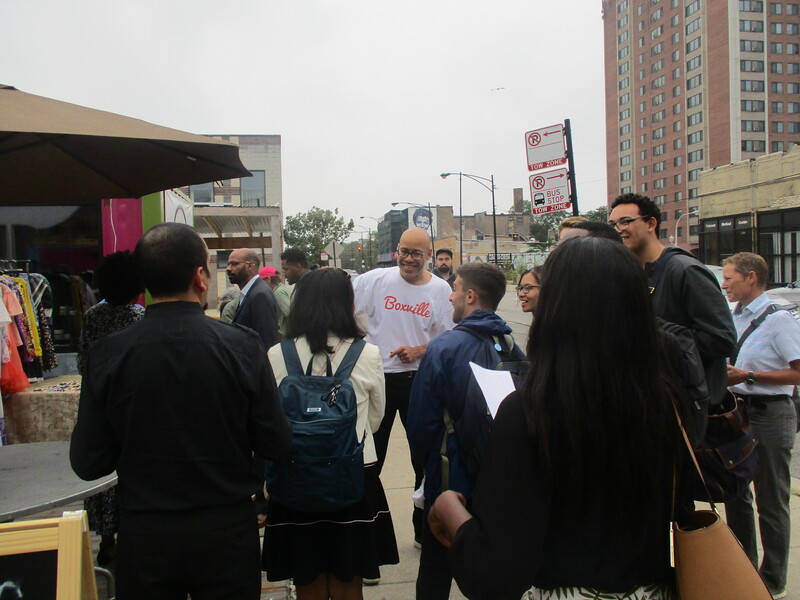 Since the 1980s, there have been many attempts to revitalize Bronzeville. While there has been some headway, issues persisted — something that was made worse by the fallout from the 2008 collapse of the housing market. Over the last few years, Loyd has been trying to do his part to revitalize 51st street commercial corridor. He bought the lot east of the ‘L’ station, the building to the west of it and a lot at the southeast corner of 51st Street/Calumet Avenue intersection. 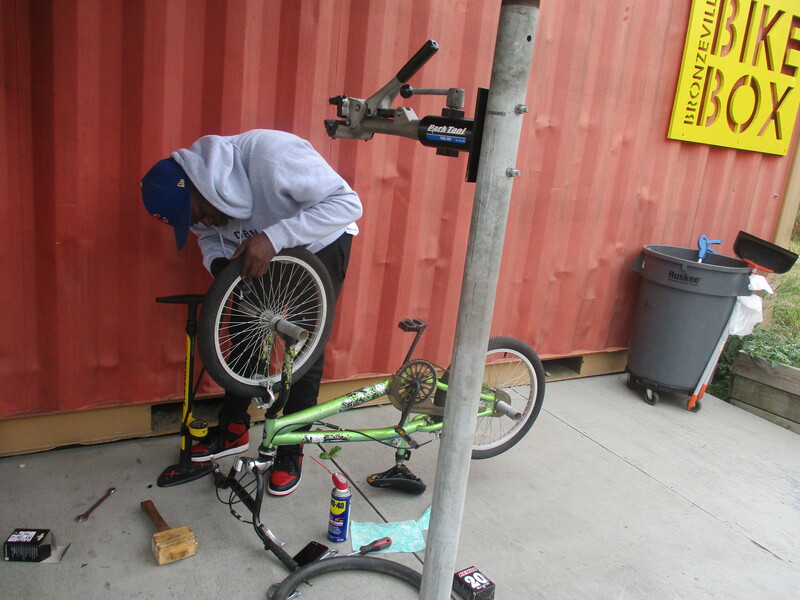 In June 2014, he opened Bike Box — a bicycle repair shop that operated from a refurbished shipping container — at the northwest corner of 51st Street and Calumet Avenue. Michelle Merritt is the owner of Aplomb Modern Vintage, a vintage clothing and accessories store that would become one of Boxville’s anchor tenants. 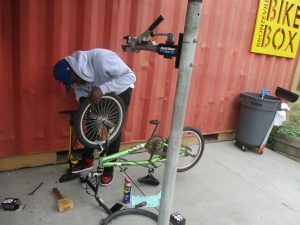 She told the Chronicle that Loyd’s experience with the Bike Box inspired him to try to expand the concept into a market. “He learned that it took about six months [to turn a shipping container into a retail space], versus about 10 years to open a brick and mortar,” Merritt said. 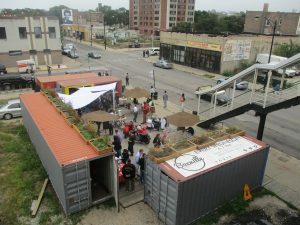 In addition to the Bike Box, the market has four containers — though only one has been fully converted into a retail space. Merritt said that vendors can rent tables for $35, while the boxes rent for an average of $500. The exact rent, she explained, varies depending on what the container is being used for. Merritt said that she already had a brick-and-mortar location in West Town, but she couldn’t pass up an opportunity to have a location in Bronzeville. Boxville Marketplace currently has four regular, “anchor” tenants — Aplomb, Bike Box, Green City Market and Friistyle, a Belgian-style frites stand. 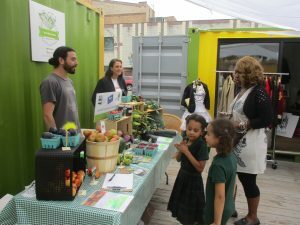 Green City Market is a Ravenswood-based non-profit that looks to creates a sustainable food system throughout Chicago by bringing food from local farms to all corners of the city and educating residents about using those ingredients to cook healthy food. 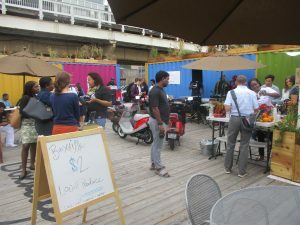 During the summer months, it operates markets in Lincoln Park, West Loop and Wrigleyville. Kathleen Williams, the nonprofit’s Operations Manager, told the Chronicle that taking part in Boxville is the newest addition. They are working to convert a green-colored container into a retail space, but, until then, they have rented a table right in front of it. “Right now, we’re popping up to be able to connect to the community,” Williams said. Most of the produce they sell comes from the same farms as the other markets. The one exception were zucchinis — they were grown at a rooftop farmers market at Bronzeville Eats, a business incubator Loyd is developing in the building on the other side of the ‘L tracks. During the summer, fresh fruits tended to sell best. As the fall got underway, corn became a major seller. Boxville Marketplace also plays host to businesses that are there for shorter periods. Clothing designer Michael Holla had a table for five weeks. He said that his mentor, Friistyle owner Corey Gilkey, invited him to take part. Holla said that his brand, Poshway, was about empowering young people and pushing back against stereotypes, so he felt that it was important to be part of something like Boxville. Andre Weaver, owner of Pillars, described his clothing line as “quality clothing for affordable prices.” Sept. 13 was his first time at Boxville, and he said the sales were steady, and he expected them to pick up later during the day. Ayesha Jaco is the owner of Shelly Jeans Vintage, which collects and sells clothing made between 1940s-70s. Sept. 13 was her second time at Boxville. Aside from some light drizzle, there was no rain on Sept. 13 — though it did rain earlier that day. Merritt told the Chronicle that heavier rains do force the marketplace to shut down — something that happened four times in the past four months. In recent weeks, Boxville Marketplace organizers made some changes. Sept. 13 marked the first time it gave a table to a nonprofit. Concitta Cavin, the market’s Marking and Branding Coordinator, told the Chronicle that it will continue to offer tables to nonprofits free of charge. “It’s our way to partner with the community, to give them a voice,” she said. Sept. 23 marked their first Saturday market. Going forward, Cavin said, it will be held on both Wednesdays and Saturdays. She said that overall, the response to Boxville has been positive. She credits the response to Boxville’s unique format. Many people stopped by simply because it caught their eye and they wanted to check it out. “I think people love it because its outside the box inside the box,” Cavin said. While many people came from Bronzeville, others came from further out. “Because of our marketing and our connections, we do have people coming from outside the community, just to see what’s going on,” Cavin said. The last Boxville Marketplace was Sept. 30, but Cavin said she is already looking forward to next year. 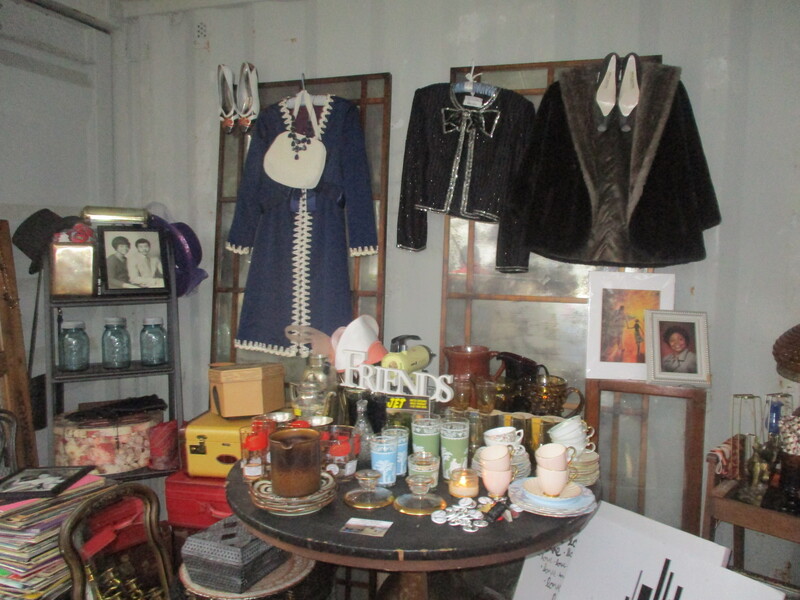 “Next year, we’re really hoping to grow, hoping to have more vendors,” she said, adding that they are hoping to get more shipping containers to use. The current plan is to open the market sometime in April and close sometime in October. The specifics will depend on whether the weather would be warm enough. “We’re in Chicago, so we start according to the weather,” Cavin. Copyright © Chronicle Media, LLC.